June | 2016 | "Teacher, teacher!" Mexicorn Dip – this dip is a refreshing snack or appetizer that can be made a day before an event. Combine mayonnaise and sour cream and mix well; add drained cans of Rotel and corn and mix well. Cover and chill. Best if made day before, serve with corn chips. Instinct may make you defensive, but this is a valid question. And the answer can’t be — because it will be on the test or because I said so. Students must feel their work has meaning and is valuable to them. If a child struggles to see value, they may go through the motions of the work, but they may not truly learn. The content has to be relevant to them today. For example, most elementary students are expected to learn about U.S. Presidents or significant historical dates and places. Is the objective to merely memorize trivia? Or are we challenging students to learn about characteristics of leadership, the principles of a Democratic society or how governing decisions affect our lives? Clearly there are some facts and figures that students just have to learn. And making it immediately relevant can be tough. In that case, you can make the work engaging by providing different modes of delivery: books, movie clips, experiments, student-led discussions, etc. As the teacher you must model for them how to go about problem solving. Navigating a confusing lesson is a problem that must be solved. Talk through the topic and show your approach: what questions do you ask yourself as you make sense of a difficulty? Celebrate when they accomplish something, teach them positive self-talk, demonstrate it for them. The Morning Meeting. Establishing routines is a key to accomplishing goals in the elementary setting. For many children, school may be the first environment where they’ve encountered a structured schedule. The more you can create rhythms, habits and routines, the more quickly your students will learn to self-regulate their own time and energy, follow procedures, and achieve learning objectives. I like to start every day with a morning ritual that includes a greeting, daily agenda, goals for the day, and a sharing time. Set the Tone. I take about two minutes to welcome the group and give them an overview of what’s happening that day. Use a positive tone to start the day upbeat, but make sure you’re businesslike and professional so they know that it’s time to get focused. Your manner will help kids focus their energy from “arrival” mode into “learning” mode. Daily Agenda. Depending on what you’re teaching, try to identify two or three specific goals to highlight. If something unique is going on during the day (a fire drill, a guest, or special activity) be sure to mention that too and quickly remind children about rules or procedures that might relate. Be brief and stick to the big picture items. Kids will lose interest if you detail every individual piece of the day. Care to Share. The morning is a good time to encourage your students to report on things going on in their lives (if something big has happened, a child will want to share it anyway, and it might interrupt a lesson later in the day.) Have a “baton” (it could be a stuffed animal, toy or special object) that you can pass around from child to child; if they don’t have anything to say, they can pass it on to the next person. If you have a class of introverts, you might create a schedule or provide topics or prompts for certain students to prepare for in advance. Indoor Recess! Two of the most dreaded words any teacher must utter. Offer some structured activities that don’t seem too structured. Part of what makes kids love recess is that its “their” free time, and you don’t want to mess with that too much. Offer choices and give the kids the opportunity to select the activities that interest them that day. 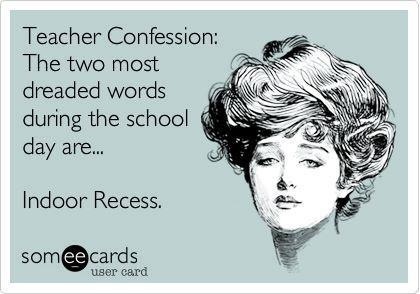 In anticipation of the inevitable indoor recess day, fill a bin with board games, puzzles, comic books, toys, travel games, craft projects, and art supplies. You might check your local thrift store or ask for “hand me downs” from parents in upper grades. It’s important that these items be reserved only for indoor recess day. If these items are exclusively available for only those times, they will feel like a treat and add some unique excitement and fun to the day. Give students the components of a game (a few beanbags, some tape, rolled-up socks, paper towel rolls, yarn, etc.) Challenge them to invent a new game or adapt an existing sport into something that’s safe and fun for indoor play. Gather the group and watch a movie or Youtube clip (something fun.) Add a play component to the viewing by creating a scavenger hunt or BINGO game, specific to the clip you’re viewing. Example: when you see someone wearing a hat in the clip, you can check it off your list, get a point, or mark it on your BINGO card. Here’s a quick suggestion to make bathroom visits a little more sanitary. Create clip-on bathroom passes for your students: one labeled for BOYS and another for GIRLS. You can use a name tag like you might have at a meeting or conference. The benefit is that once it’s clipped on, their hands are free to do their business and wash up without touching the pass. Have hand sanitizer within easy reach of where you store the bathroom pass, as an extra measure to help kill pesky germs. Auditory Comprehension – When you read aloud, a student’s auditory memory systems are engaged. Comprehension goes up (skyrocketing for auditory learners) and this modeling will enhance their ability to participate in daily conversations, answering questions, and following directions. Mental Imaging – When students listen to you read a story, they are training their minds to ‘picture’ what is happening in the text. In a culture overrun with visual media, students are bombarded with pictures and images already programmed for them, and this exercise is extremely beneficial. You can help facilitate this by modeling it for them. Periodically stop at the end of a passage and tell your students what you’re picturing in your mind. Prompt them to do so too and/or poll the class for suggestions on how the image might appear in their imagination. Discussion – Wonderful conversations about predictions and opinions can occur when you read aloud. The practice helps them connect events in the story to their lives. Seeing fiction through this real world lens can help students begin to internalize symbolism, see a broader world view, and recognize similarities & differences in the characters and story outcomes. By drawing the story out over the course of several days or a few weeks, you can build anticipation. Multiple Resources – By reading aloud to students you can introduce other texts in addition to the primary ones you may be featuring. For example, if the book is set in a foreign land or a historical context, reading a nonfiction book can provide background information or further color the narrative in the students’ minds. If you’re covering a topic in a different subject (history, math, or science) you might read a related book aloud to supplement your teaching and further engage them. For more information on this topic, I recommend The Read Aloud Handbook, a classic title by Jim Trelease. Originally released (way back) in 1982, the book has been revised numerous times and still holds up with actionable ideas and suggestions for impacting your students through the practice of reading aloud. Numerous analysts celebrate the power of journal keeping, and its importance is especially critical for young learners. I believe everyone can benefit from developing a practice of looking inward, recording actions and feelings, and observing their world with a critical eye. So how do you take journal writing from an assignment to an opportunity? How do you make it something that kids will look forward to continuing long beyond their time in your class? Variety and consistency are two important things to incorporate as you move into this with your kids. For some students, the act of writing will be a foreign concept, and providing prompts and assignments can be helpful. Your journaling assignment could take the form of a daily diary or creative writing. (See examples below.) Your students’ journals could be a series of responses to journal prompts, i.e. questions or considerations that ask the student to evaluate their mood, set or reflect on goals or objectives, or wrestle with life challenges and common situations that they might face. Begin the journal process by having students observe you modeling it; writing in a journal either on your ELMO, Smartboard or overhead projector. Brainstorm a list of topics that you might write about and list them in the front of your journal. Then each day for a week, share examples of how to write about a few of the topics. Go back and edit or revise something you’ve written; add to the topic list based on something you did the previous evening. After a week or so, have them begin their own topic list and journal writing. As they progress, conference with them about what they’ve written. Use the time to nurture their early attempts to craft a story or communicate their ideas. I would suggest that you avoid “grading” the writing itself. You can track participation and even make the journal assignment mandatory, but the value of journaling comes more from the act of transferring thoughts into words than from the mechanics of writing. Accuracy, sentence structure, and clarity aren’t as important as learning to process ideas and take thoughts captive in written form. When a child begins to make progress in turning a phrase or communicating more clearly, celebrate their accomplishments, and challenge them to go to the next level. Have them refine their list of journal topics as their interests or experiences change. As the year goes by, model for them how to bounce ideas off each other and collaborate. At the end of the year, have the students look back at their early work, and compare the ways they have matured or changed during the course of the school year. If you teach at a school where your students go to a specials class (i.e. art, music, P.E., etc.) it’s a good idea to intentionally connect with those teachers to find out what their expectations are for your students. Once you understand their procedures, you should emphasize them with your students; help them understand the importance of carrying over your expectations for good behavior into those classrooms. Then during the first two or three weeks of school, check in with the specials teachers and see how it’s going. Inquire for specific feedback; if there are ways you can follow up or reiterate their concerns, do so. You should treat your relationship to these teachers as a partnership and do what you can to remedy difficult situations. When a student is assigned to your class, you should treat them as “your students” no matter where they are in the building. You can’t afford to take the stance that when they are out of your sight they are someone else’s responsibility. Students will pick up on this and sense that you only care about them when they’re in your class. It’s my belief that the key to being an effective teacher is to show genuine care for your students well being. Think about it from this perspective: how would you feel if you thought that your spouse, friends or own parents only cared about you when you were physically near. Those relationships would feel pretty hollow, and the value would be superficial at best. As the teacher and leader in the class it is your responsibility to reinforce the expectations for other classes. Certainly, the specials teachers should set their own classroom expectations and enforce them, but your students need to know that you support those teachers and expect obedience and achievement in any location, not just your room.